Jackrabbit allows you to offer a class as a trial (in the industry this usually means trying one class for free). This feature uses the Enroll Type of Trial which lets your staff know that the student is a trial student. Enroll Type of Trial can be excluded from the Post Tuition Fees. If the student completes the trial and wishes to enroll permanently, then you should change their Enroll Type to Trial - Enrolled. The ability to enroll in a class as a trial is a per class option. The Class must have Allow Trial Enrollment set to Yes on its Summary tab. For more detail, see Classes / Lessons. Students can be enrolled as a Trial using Quick Registration/Add Family. Point to Families and click Quick Registration. When completing the Student section, set the Trial Enroll? field to Yes. Optionally, select a Future Drop Date that is the day after the actual trial date, so that the student will drop from the class after their trial class. After submitting the Quick Registration, the student's Enroll Type will be set to Trial. The student will display on the Class Roll with the word, (Trial) next to their name. 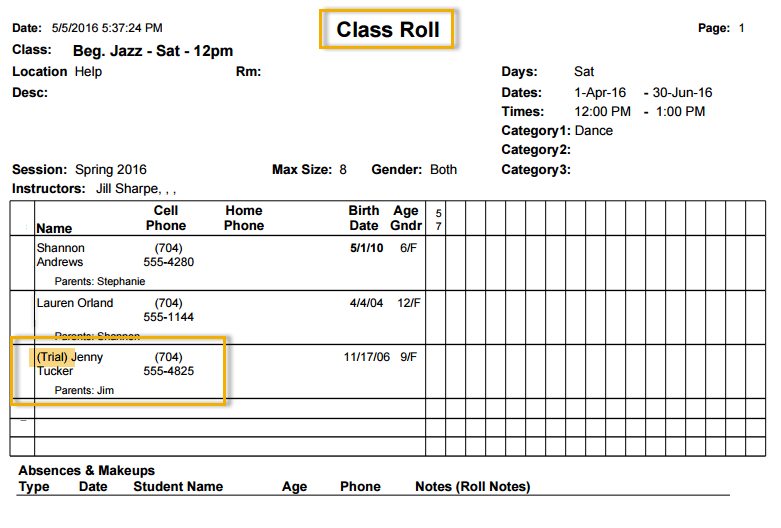 A student can also be set as Enroll Type = Trial by going to the student's Classes tab and changing the Enroll Type from the drop down list provided. Be sure to click Save Changes. If your organization is set to allow future enrollments, students can also be given the Enroll Type = Trial when being enrolled via the Enroll button or link.